Here we are, then, with the last matchup of our first round. We have whittled 24 drivers down to half that, and set up six fascinating pairings for the second round. We'll likely take a day off before the second round gets underway, but before that, it's time to vote on today's drivers. 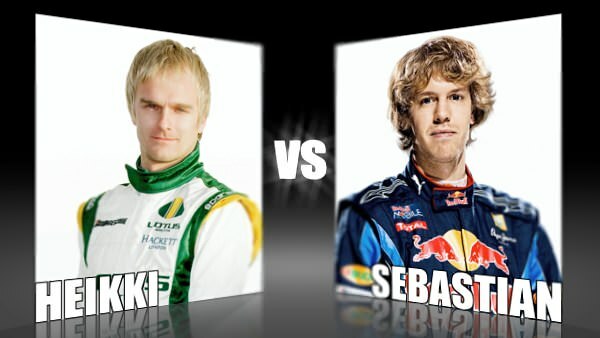 We've got Lotus man Heikki Kovalainen against Red Bull Racing's Sebastian Vettel. We know that Heikki will be getting at least one vote from a dedicated fan in Melbourne, but will he get your vote as well? The likeable Finn has made a tough transition from Renault to McLaren to the back of the grid, but he seems more relaxed now, even if the results aren't forthcoming. He does make strange advertisements for MTV involving horses, but he's active on Twitter and very engaging. We've noticed a change in Seb recently, now that the pressure is on and a championship could be within his grasp. He's no longer the happy-go-lucky driver that entered the sport and became the youngest driver to win a race. Things are more serious and he is a lot more focused. That's not necessarily bad, though. He does the job out on track and he still entertains the fans.